Built 1873-1875 by Stehlin von Bavier. Opened 4 October 1875 with Mozart's "Don Giovanni". 1500 seats. 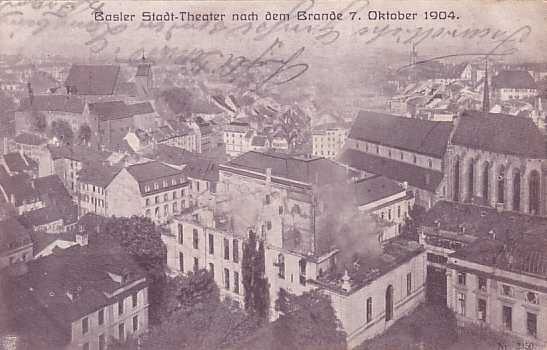 Destroyed by fire on 7 Oct 1904. Subsequently rebuilt. 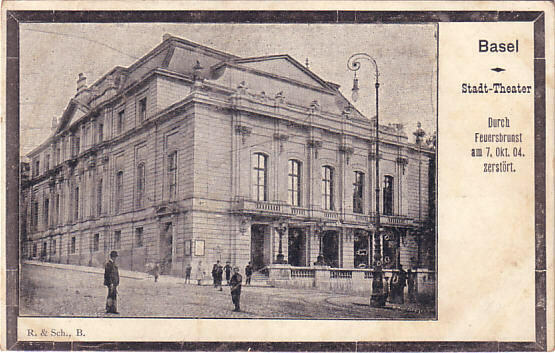 Re-opened 20 Sep 1909 with Wagner's "Tannhäuser" (then 1132 seats). 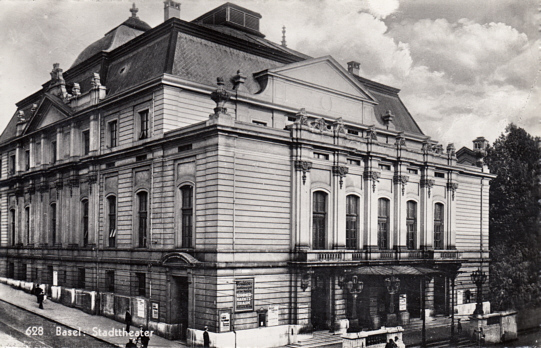 Demolished on 6 Aug 1975 after the completion of the new Stadttheater nearby. The site is now occupied by the Fasnachtsbrunnen fountain (also known as "Tinguely-Brunnen"). 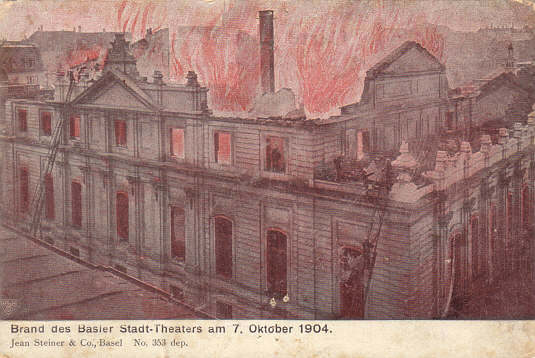 Front Text: "Basel, Stadt-Theater, Durch Feuersbrunst am 7. Okt. 04. zerstört." Publisher: R. & Sch., B. 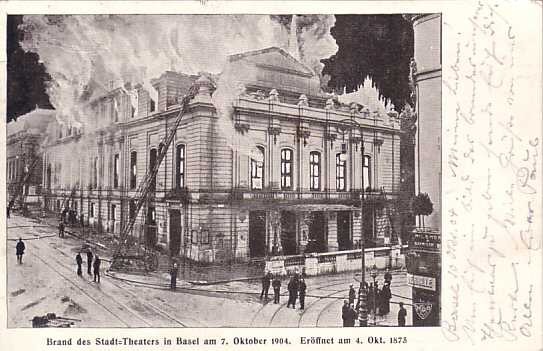 Front Text: "Brand des Basler Stadt-Theaters am 7. Oktober 1904"
Publisher: Jean Steiner & Co., Basel; No. 353 dep. 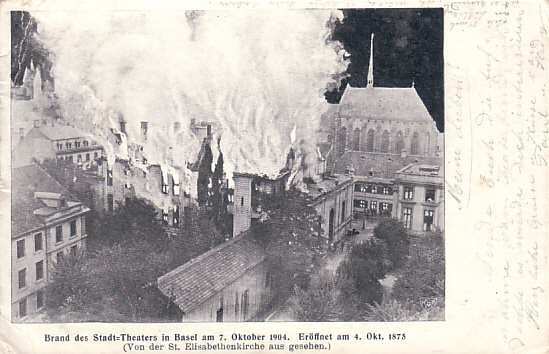 Front Text: "Brand des Stadt-Theaters in Basel am 7. 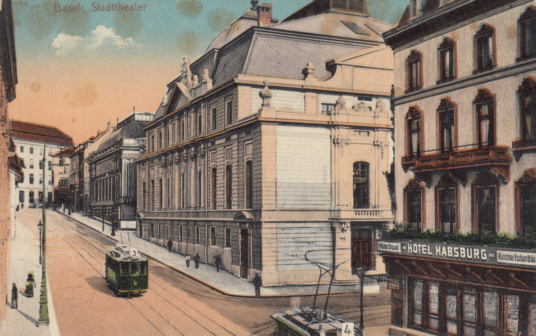 Oktober 1904. Eröffnet am 4. Okt. 1875"
Publisher: Edition Phot. Franco-Suisse, Berne; Ideal No. 5841.